Organizations need to understand that cloud optimization is not limited to only reducing cost without compromising on load balancing and server capacity. This aspect has much larger implications. It is the most fundamental requirement for a cloud environment to have its applications running in perfect sync without any bottlenecks. Why it is necessary to ensure that high CPU utilization of EC2 instances should not occur continuously? As discussed earlier, users can potentially have hundreds or even thousands of EC2 instances running in their infrastructure. But this might take your AWS EC2 CPU utilization to reach an extent where your performance will probably get hampered. The CPU utilization is a metric associated with usage of EC2 instances and varies depending upon the workload assigned to an instance. If AWS EC2 CPU utilization is high, it means that there is an effective utilization of instances and ensures smooth operations as well. However, if CPU usage of instances is regularly striking a higher rate, say constantly reaching around 90-100%, it indicates that application may not have enough resources to further continue the operation and there is a potential chance of crashing. 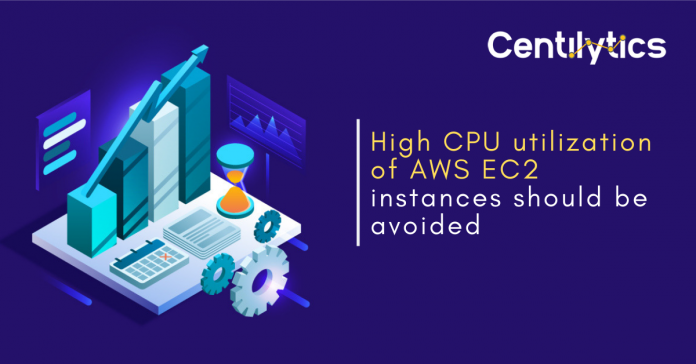 Centilytics lists down all your EC2 instances with high CPU utilization so that users can take note of that and can take actions such as upgrading such instances to make sure that performance of your cloud infrastructure remains optimized. How does Centilytics help you to optimize your AWS EC2 CPU Utilization? Centilytics helps users in formulating strategies to optimize their cloud performance and throughput through some recommendations such as giving some attention to the CPU utilization levels of EC2 instances. Warning This indication will appear when an EC2 instance crosses more than 90% of its CPU utilization on at least 4 days out of last 14 days of its operation. Identifier: This column shows the unique instance ID of the corresponding EC2 instance. Instance Type: This column shows the type of EC2 instance being used. Severity Applying severity filter will display data according to the selected severity type i.e. selecting critical will display all resources with critical severity; similarly for resources with Warning and Ok severity types. Resource Tags Value Applying resource tags value filter will display data which will have the selected resource tag value. For e.g., If the user has tagged some resource by a tag named environment and has given it a value say production (environment:production), then the user will be able to view data of all the resources which are tagged as “environment:production”. Users can use the tag value filter only when a tag name has been provided. Previous articleHow to get a 360° visibility into your Azure Virtual Machine cost by family?